Hot on the heels of Chemical Playschool 15, Taos Hum and The Gethsemane Option full length LPD albums already released in 2013, The Dotz put out two more Herculean “Labours” of “Love” in their 33rd year of existence in Vinyl only format and a limited autumn USA tour CD on two more different labels. The ever productive band have already since last June released two CD’s, one download and one Vinyl only on three separate labels in blinding speed, so if you missed any of these you might have to get going and download them from their Bandcamp page or pay high collector’s prices. Namely the proper CD on Metropolis Records last June (The Gethsemane Option, which I reviewed here in AI last August and is still availible on CD), the download only Taos Hum from last spring, Chemical Playschool 15 CD in early 2013, and The Curse Of Marie Antoinette extremely limited pressing in 299 copies only, a 12″ picture LP last September, the latter two both on the Rustblade label, while lastly their Code Noir CD in very limited pressings on the Beta Lactam Ring Records label, just now last month in October when the Dotz were sweeping across the American continent coast to coast on tour to the always welcoming American Skinny Puppy based fans (a band they seem to share a large US fanbase with partially due to lots of interaction between the two as the band Tear Garden, of which there are words of a reunion). I actually ordered a copy of Code Noir directly from Phil “The Silverman” Knight in the band via an email some months ago, and he kindly advance posted me a CD I never paid for the same day BLRR posted out the copy I bought on eBay for 20 dollars. So now I need to pay Phil and “sit on” my other copy and sell it at an inflated price next year on eBay, cause I am not bothering with return postage, hehe, its like the Dots chopshop is going through the roof on these for collectors. Kollekting Business aside, the picture LP looks really cool with the different art on each side of the vinyl, with the tracklisting printed on the LP groove on the B-side. And the music? 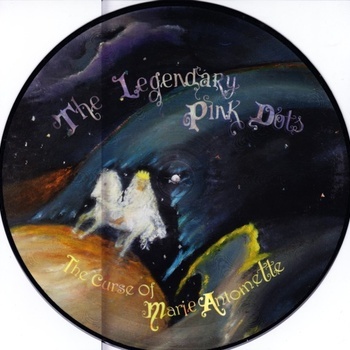 It opens with the title track, The Curse Of Marie Antoinette, a melodic and melancholic Dots tune in the vein of their oft played signature from the early 90s, Princess Coldheart. It is a good pop song with lyrics about someone’s first meeting with Marie Antoinette and how it ends in tragedy. Two more tracks follow on side A, namely Something’s Burning and Hallucination 33. On side B we have three more tracks, Catwalk, Ballerina On A Rice Paper Leaf and Ghost Of A Summer To Come. Some tracks are melodic, some kind of stretched out and hallucinatory with low piano, and some with weird distorted techno beats and spoken lyrics by Edward Ka-Spel fading in and out. Catwalk and Ghost Of A Summer To Come are quite memorable yet very subtle observations in deep Dots-like ethereal inner workings style psychology, the latter track about a family picnic and a ghost of a drowned woman and mischievious hauntings or something alluring to a Poltergeist. It is a very cryptic and strange record overall, really. Edward seems to tell stories more than sing on these tracks. It is a very likeable record too, actually, in a subtle way. I like it. It is very floating and spacey and psychedelic, but lacks focus alot of times like the Chemical Playschool 15 CD, stylistically sounding anyway, but more coherent with more sensible lyrics… “And I wish we’d never met, Marie Antoinette”, as the final lyric of the title track ends! The LP is about 46 minutes long. So now then, that that haunting and ethereal record is behind me, it is very heady stuff, maybe it owes more to early 90s dreampop and shoegazer ala Pale Saints, or The Boo Radleys than anything the Dots have experimented with beforehand. On to Code Noir then, a CD with seven tracks, overall a similar ride to The Curse Of Marie Antoinette in the same way it is very different than Taos Hum and The Gethsemane Option albums. I am not sure I “get it” what the lyrics hint at, mostly about being lost and confused and poor and desperate, with something about people speaking Cantonese on the opener called Six Easy Lessons. Must have some of Edward’s opium stash then! I know he is a smoking Chinaman in Hell! Cloud 6 follows and opens with an airy piano much like on Ghost Of A Summer Yet To Come. The lyrics here are surreal and personal and I get the idea the band are attempting a new “artsy” style on these two records, with echoey voices fading in and out. Spare Change is the third track, “empty my pockets with crumbs and coins”… something lyric something… “treasure of treasures for you to find…”, really, I knew the Dots used to be poor and lived in squats on breadcrumbs and begging at train stations, but this is enigmatically mysterious. I don’t like this track much. Nor do I care for the following track, Life Is Hard And Then…, which is equally droning and low key with lyrics about more desperation or poverty of sorts. Ascension 3 follows and is a variation from their Seconds Late For The Brighton Line 2010 LP track, Ascension Day, again with piano intro, but it picks up a groove in a Krautrock motorik guitar way, very NEU!-ish (The Dots covered Super on a NEU! tribute in the 90’s and in a live concert setting they totally jam out and drone on krautrock themes, ever since Erik Drost replaced Martijn DeKleer on guitar in 2010). After this, the song Testing 1-2-3 follows, with more convoluted mysterious lyrics that leave me cold. Two Steps Beyond opens with a whispered sinister “Here I come..” and some piano again, echoey and weird and dreamy. I find Code Noir to be too abstract and unfocused like the Chemical Playschool 15 album which I slagged so badly last winter here at Aural Innovations. I really find little meat on the bone on Code Noir compared to the Marie Antoinette LP which is beautiful and haunting with its stylish dreampop and ethereal spoken ghost stories. The two releases are definitly related, but I find the former album much more satisfying. Being seemingly only for die hard fans, this Code Noir disc, I shall file under “I am all confused now, I want my Candycane Underwear and Fly my Doodybirdpropeller” and then I will “Trip the Light Fantastic at The Terminal Kaleidoscope and await Nuclear Holocaust and ascend like a battling Arch-Angel anno 2014 in Dots world Agape at the New Melting Dreampop Flashback Propellerhead Dawn to follow”. Its just out to be bizarre and weird and geeky and convoluted, and not very good I am afraid. Now go and download the Marie Antoinette LP which is very nice, and don’t bother with Code Noir unless you want that one Krautrock track which is really the only good track on there in my opinion. The rest is Chinese to me, sorry Edward, I have no clue what goes on in your lyrics most of the time these days.